I pinched these delightfully feminine images from Crashing Red's ultra fashionable blog. Adore the dainty jewellery and her pretty, pleated dress; the epitome of refined simplicity. I love the soft animal print and the pleats in that very feminine dress. I think I might have closed the window before the comment got posted! :) I had said - So Pretty! Thanks for the Intro. Those nails are beautiful! Wow- never thought I would like the look of that. And seriously- how leopard print could be so romantic is beyond me. Beautiful. The neon tips are pretty cool. Totally trying those nails. Love the simplicity. I agree - the dress and the manicure are so under-stated but classy! I totally love that manicure and I'm going to try to copy it. Love the dress...so fun and flirty. Hope you have a great weekend!! Oh these are so pretty! The nails are funky, but she makes them look delicate and sweet! PS: I'm hosting an international giveaway on my blog ♥ Come and join! Sweet shots. There to help us through the roughest winter. Keeping on dreaming. And cherishing the cold too. Makes coffee even better... Stardust! 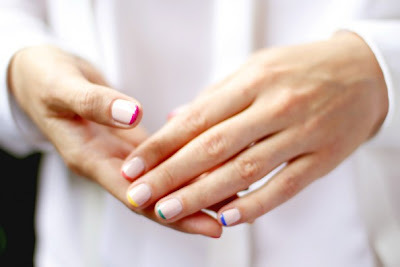 I will have to try the neon nails, it's a great spin on the typical french manicure. The first image is so beautiful and the refined simplicity is all the subtle details. Not sure if I would go for neon nails - having said that, today I'm making my contribution to the neon-trend by wearing a bright green skirt...does it count?! Wish you a nice week Barbara. the nails in the last pic is awesome! oh i saw that first photo on facebook earlier this week--still loving it! Oh my goodness! You're amazing! Thank you very much... I thought of you today! and here we go - what a pleasant surprise! It's really flattering to hear compliments from you as deeply adore your immaculate sense of style! Hope you're having a fantastic week, darling! Oh I just adore the idea of that French manicure! Thanks for sharing ;) Both pics are oh s inspiring!